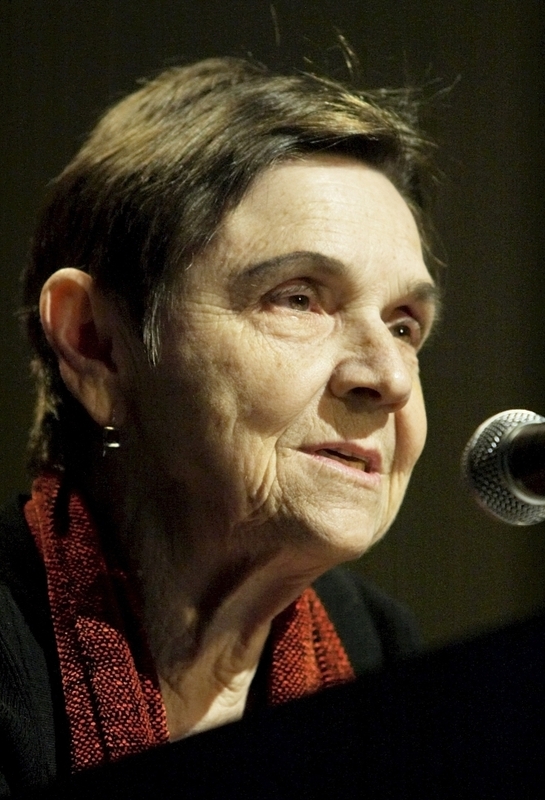 Adrienne Rich: Resolution Amid The 'Turbulence' The memorials for poet Adrienne Rich, who died Tuesday, include plenty of references to her political activism and eventful personal life. Amid this, Critic David Orr pauses to reflect on one poem — a testament to her perseverance and her art. Poet Adrienne Rich, seen here in 2004, died Tuesday. The memorials for the poet Adrienne Rich, who died Tuesday, will inc­­lude plenty of references to her feminism, her sometimes polemical leftism, her precocity, her difficult marriage (her husband killed himself in 1970), her subsequent partnership with the writer Michelle Cliff, and the books — beginning with 1963's Snapshots of a Daughter-in-Law — that made her internationally famous. What can get a bit lost in all this, however, are the poems themselves. Or rather, what can get lost are the poems that don't fall so readily into the heroic public narratives that Rich herself often encouraged. It's worth pausing over one of those poems. Not because Rich's signature poetry isn't worth reading — it is, and Snapshots is a fine place to start — but because it's good to remind ourselves that strong writers resist becoming monuments. Even when they seem nearly immobilized in memorial bronze, bedecked with a plaque that reads "Important Poet," there is a part of them that shifts position as soon as you look away. The poem has two related aspects worth noting right away. The first is its remarkable fractured syntax — the way the poem prepares us for a verb with "cliffs of fall" as its subject, but gives us instead a kind of admonishment: "may who ne'er hung there let him / watch the movie." The twisting lines mirror the speaker's panic. The second quality to notice is the poem's adaptation of another poem, Gerard Manley Hopkins' "No worst, there is none. Pitched past pitch of grief," from which Rich's poem borrows several phrases. Hopkins' poem is one of the great cries of anguish in the English language, its tortured phrasing occasionally resolving into a ruined plainness: "Comforter, where, where is your comforting?" Of course, says Rich, the people who aren't bothered by the type of anguish I'm talking about — this turbulence — are content to go about their business, keep on watching Pirates of the Caribbean: Dead Man's Chest, and so on. Rich has never been a funny poet, but there is a stoic humor that complements the poem's fundamental seriousness. If Hopkins views mental anguish as a series of plunges, Rich sees it as a rise in a fragile conveyance ("It's built to do that") that is a symbol for our fragile selves ("You're / designed to tremble too"). And of course, the higher you go, the further there is to fall. Rich is doing something very complicated here. She's mocking the stilted way in which we discuss true disaster without really discussing it ("In the event ..."). But she's also finding, in the stale language of Official Preparedness, a kind of truth. What can one do in the midst of anguish? "Put on the child's mask first": Think about others. How can we calm ourselves? "Breathe normally": Which is to say, breathe regularly. And what is controlled breath? For a poet, it is the English line, which has been held steady through disaster from Gerard Manley Hopkins in the 19th century to Adrienne Cecile Rich in the 21st. Honoring that line involves little drama, perhaps, but no small amount of resolution — and it is this perseverance that makes a poem like "Turbulence" memorable, and that makes its author impossible to forget. David Orr writes about poetry for NPR Books. His most recent book is Beautiful & Pointless: A Guide to Modern Poetry. 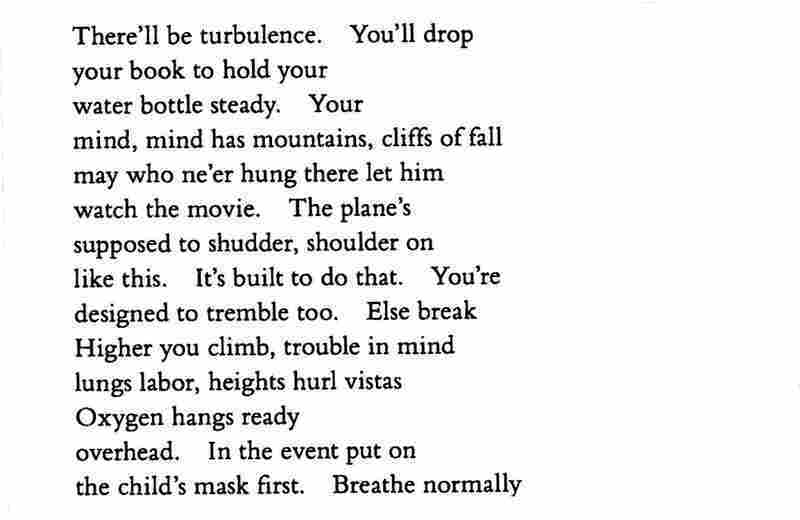 "Turbulence" is reprinted from Tonight No Poetry Will Serve by Adrienne Rich. Copyright 2011 by Adrienne Rich. With the permission of the publisher, W.W. Norton & Co.